Last month, I asked you readers for specific situations you needed help applying logical consequences in, and we got quite the response! I will take each response and tell you exactly what I would do if one of my children did that, or what we have done when our children did that. I was going to address them all in one post, but after starting to write it, I realized it would be one long post. So I will break them up item by item and make a series out of it. “Arching back” yelling tantrums in public! Oh, the joy. The child throwing a fit in public. This can be quite paralyzing. You know there are people looking at you with raised eyebrows thinking about what a bad parent you must be to have a child behaving like that. There are also people who have never had children thinking, “MY children will never act that way.” Those a little closer to this stage of life will look at you sympathetically. Some might be interested to see how you handle it to see if you can give them any ideas. Others will sigh a breath of relief that this isn’t their child. Please rest assured that some day, your child will throw a fit in public. Even the best-trained children do it. It is a great place to test mom and dad. It isn’t an “if” but rather a “when” question. How often these occur will depend highly on how you react to it. For our family right now, none of our children are in this phase. Brayden and Kaitlyn have outgrown it and McKenna has yet to reach it. So first, what would I do with my children at their ages? My exact reaction to this, as with probably all of the situations, would depend on the age of the child as well as the reason for the arching of the back. McKenna is 13 months old. While McKenna hasn’t really reached this point, I know from experience it is coming, and probably within the next month :). I find these little ones quite easy to deal with. You can’t really expect to reason with the 13 month old, and you really aren’t likely to stop the fit like you can an older child. It is more of a situation to “ride out.” With McKenna, I will hold her until she is done with her fit. If we are in a place where a fit isn’t appropriate (like in a church meeting), I will take her out of the meeting and into the hall and hold her until she finishes her fit. Here are some “dos” and “don’ts” for this situation. Tell the child to stop. If your child is old enough to understand, you can tell your child to stop. I can do this with Brayden. He doesn’t throw fits anymore, but he will start to cry sometimes. This is a delicate situation because his reason for crying is disappointment, not in order to get his way. I will tell him I know he is disappointed and that is okay, but he needs to learn to control his crying and be accepting of rules. Remove the child. Probably one of the things I do most in a public setting like this is remove the child. If the child is throwing a fit about something, I physically pick the child up and remove him/her from the situation. I might just take them out of the room, to a different aisle, or even out to the car. Remain calm. Children really can sense your emotions. They feed off of your emotions. If you are upset, they will be upset. 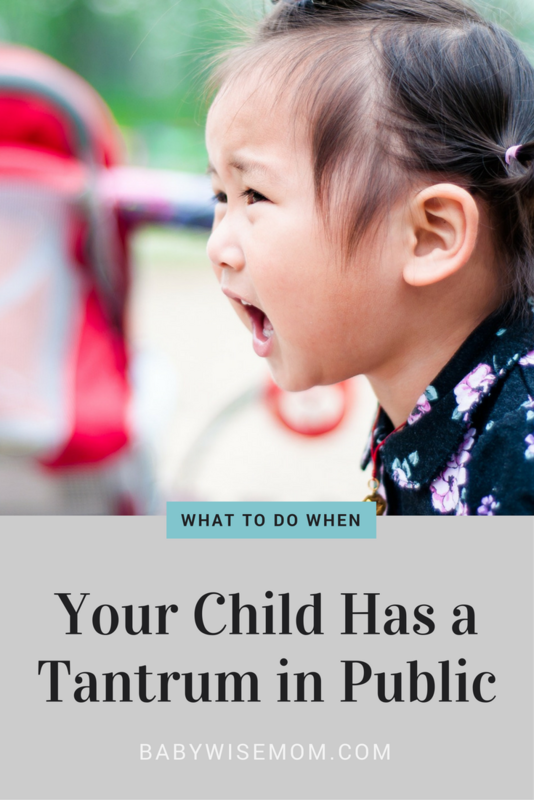 Yelling isn’t going to make your child want to comply (really, probably nothing will during this public fit, so yelling will just make you look ridiculous). You keep yourself calm. Act like you don’t care. Show sympathy. If your child is upset because he doesn’t want to leave or because he wants out of the cart, tell him, “I know you are sad because you want to stay. I know this is lots of fun. But we need to go home now.” Sometimes children seem to think you don’t understand the reason they are upset, so if you can assure them you understand the reason, but things still aren’t changing, then you might get somewhere. Eventually. Talk it out. Tell your child what you are doing, what he can’t be doing, what will happen if he keeps doing it, etc. Keep a nice, calm voice the whole time. Follow through. If you tell your child that if he can’t stop crying, you are going to leave the store, and yet he keeps right on crying, leave! Don’t give any threat you will not follow through on. Take away privilege. One of my most commonly turned to forms of discipline is the loss of privilege. This is most effective as a teaching tool when it directly relates to the behavior. Did you throw a fit when it was time to leave the park? Next time, we won’t go to the park. We will stay home. Did you throw a fit when you didn’t get a treat? You won’t get any treats tomorrow. The 14 month old won’t comprehend causation, so this doesn’t work for a pre-toddler, but at some point between 18-24 months, your child will be able to grasp this. Leave immediately. A great method is to just leave the store–even if you have a full shopping cart. If you do, you will show your child his fits will not be accepted under any circumstance. If you are somewhere you can’t fully leave, or if your child is throwing a fit in order to leave (say, church), go somewhere you can “leave to” like a hall, and then keep the location very dull. My children are allowed to quietly look at books and play with quiet toys in the meeting, but if we have to go in the hall, they are only allowed to sit still with their arms folded. The younger children sit in our laps. The hall is not a fun place to go. Leaving immediately is a great option for those fits of emotion. Leave the child home. If Brayden were to suddenly start throwing fits in public, then I would just leave him home. I would hire a babysitter or just go out when my husband was home. I would explain he doesn’t get to come with me to the store because he can’t show behave appropriately while there. My kids love to go places, so this would be a real punishment. Wait for the fit to end. Another tactic is to just step back and calmly wait for your child’s fit to end. I wouldn’t talk to the child or anything. I would just stand and wait for her to be done. When she is done, ask her if she is done throwing a fit, then move along your way. I would then later explain it was too bad she can’t go to the store without throwing a fit because now you have to go without her and you like to take her with you, etc etc or whatever you explained would happen with ask & tell. Walk away. Most of the time, fits are for attention. Some books say all of the time fits are for attention, but I don’t agree. Some fits are out of anger, frustration, or sadness, in which case the child doesn’t care if you are watching or not–he is throwing a fit to blow off steam, not get attention from you. If this is an attention fit, the walk away strategy could work. I think this is also more likely to work with the child closer to 4 than the child closer to 2. I haven’t personally ever tried this method, but I have read about it enough I thought I would include it in your list of options. Give in. Number one rule of fits. Don’t give in. If your child is throwing a fit because he doesn’t want to leave, don’t then concede by offering five more minutes. Giving in teaches the child that fits work. Think carefully before you tell your child no or announce you are leaving. If you know you will give in if a fit happens, just don’t say no in the first place. It is better to say yes initially than to say yes after a fit. Reward. This is along the lines of giving in. Donn’t reward the child’s fit. Your child needs to learn that the fit is not an acceptable form of communication. It is okay to be sad, but not okay to throw tantrums. To give you a boost, here are some of my stories about public fits that I remember. I remember the first time Kaitlyn threw a fit in public. She was around 20-22 months old. We were in a store. I can’t remember why the fit started, but I think it might have been something over the shopping cart. We had been in the store less than one minute and she marched into the middle of the aisle, laid down on the ground, and threw a fit. Oh I couldn’t help but laugh. My husband and I looked at each other amused. If she had been our oldest, we probably would have been mortified, but Brayden has always been a better fit thrower than Kaitlyn, so her fits have always been merely humorous to us. We both just stood and watched her until she decided she was done (it was only a minute or two). We then continued on doing whatever it was she was unhappy about and she complied. If she had continued the fit, we would have just had one of us go sit in the car with her while the other got what we needed. Another Kaitlyn story. She was again around 22 months old. Let’s remember that I was nearing the end of my pregnancy with McKenna. We were leaving a store and I told her to hold my hand. I have a rule that if they want to walk, they need to hold my hand. She didn’t want to hold my hand. I told her she could hold my hand or I would carry her. She still refused. So I picked her up and carried her across the parking lot as she screamed and squirmed. It was highly uncomfortable for me, and it was a large parking lot, but I am also highly stubborn (a trait that can come in quite handy as a mom) and I carried her every last step to the vehicle. She never refused my hand again. A Brayden story. Brayden’s public tantrums usually revolved around him not wanting to leave a fun place. He has always, and still does, hated to leave a place he is having fun. Normal right? Sure. But he extra hates it. I always give him fair warning to help minimize the sadness, but as a toddler and even early preschool years, I never knew for sure that he would react nicely when it was time to leave. And actually, I think we had a similar situation when McKenna was born. Our first time to the park after her birth ended much the same way, though I seem to remember a crying newborn, a crying toddler, and a crying preschooler. It was a day to make me never want to return to the park again (don’t worry, we have). A good trick for this situation is to figure out the motivation behind the fit. Is it to express himself? Then work in times of non-conflict to teach him other ways of expressing himself. He might need to learn sign language. You might need to teach him some things to do when he feels upset, like to take a really deep breath. Is the tantrum because he thinks he will be able to change your mind? If so, major consistency and follow-through will be required. In the end, training for dealing with public fits starts at home. Train in times of non-conflict and employ ask and tell to avoid the fits. Also, don’t expect your child to behave differently in public than he does at home, and don’t expect him to react to some new technique in the store that you have never done at home. If you want your child to listen in public, he needs to be a super good listener at home. I said it earlier, but I want to reiterate that every child throws a fit in public at some point. I know it isn’t fun, but it also doesn’t mean you are the world’s worst parent, even when you get glances telling you otherwise. With time and consistency, you can work past the age of public tantrums–but don’t think that the child will naturally outgrow this phase with no intervention from you. Follow the dos and don’ts listed above to help your child along the way. Previous Post Why Have Naps? Val I LOVE it when ever you write anything that describes your children in real life situations. It makes me feel better when my daughter isn't perfect You're like the "ultra" mom, so if your kids have fits, then when my kid has one, I don't always have to blame myself and think that I've somehow caused it. You're awesome. Keep on keepin' on. Absolutely. I have stories JUST like this!!! We do the hand-holding thing too. And stay away from tough situations when I know they will be extra hard (new baby, etc.) Thank you for this post! I love how clear you are with the tips and tricks. They DO work! This is so nice to read because sometimes I'm not sure I've done the right thing discipline-wise. I recognize some of my tactics in your post, which makes me feel good, but it also reminded me of things I'm doing with my 11-month-old that will eventually lead to bad toddler times if I keep them up! I think it is easier when it's not your first, because you realize the world is not going to end if your little one decides to throw a fit one day. Laura, thanks and you are welcome! Oh boy, I really have to try hard not to laugh when my kids do some of these things! Hi Val,A couple of questions for you:1. Under what circumstances would you choose to hold your child vs. wait for it to end and/or walk away?2. Is there a difference between a mini-fit and a child crying because you asked them to do something they didn't want to (i.e. go to bed, change activity, etc.)? Or, is that a mini-fit? Thanks Val! MHO,1. It probably depends on if the child is able to continue doing it or not. Like, when Kaitlyn was 14 months old, she kept throwing gravel in the swimming pool. I kept telling her not to. She threw a fit and I held her until she calmed down. I didn't want her throwing gravel in the pool. But if the fit was that the child asked for a sucker and you said no, I would probably walk away.2. I call a mini-fit the fit in young toddlers. Pre-toddlers. These fits are not very big and not very long. So no matter the reason, the mini-fit to me is just a fit that isn't big. When Brayden was my only, I had no concept of mini-fit. It wasn't until Kaitlyn was able to start throwing fits that I got it.